Good Times for Average Betty! Follow your dreams. Especially when you dream of bacon piñatas. Today is a very exciting day. And not just an exciting day for me, but for all online cooking shows, all of my fellow YouTube Next Chefs and averagebetties everywhere. 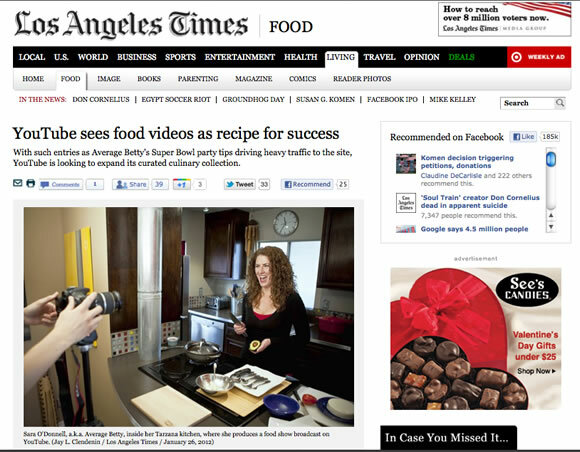 Thank you, Rene Lynch and LA Times Food for telling my story and starting the conversation about food and video. Thank you, Jay Clendenin for taking such beautiful photos and not making me look old or fat. Thank you, Austin Lau for going on the record that I make you laugh! And last but certainly not least, thank you, Lee O’Donnell… my hot husband and co-producer, for believing in my crazy aspirations and trying all my experimental recipes. Read the complete article, YouTube Sees Food Videos as Recipe for Success. Watch Rene Lynch and Betty Hallock of Los Angeles Times entertain my shenanigans at 2011’s The Taste. Check out Average Betty at the 2010 inaugural Los Angeles Times Celebration of Food & Wine with LA Times Food Editor, Russ Parsons and Test Kitchen Manager, Noelle Carter. Wow. How awesome is that! Great job! Always love your videos! Thanks, seti! The article in the Times and all of the support has been humbling. Makes the hard work feel very worth it… I sure don’t feel like this is overnight unless I’m Sleeping Beauty! Three cheers for Average Betty! You’re a favorite around the Wine Harlots World Headquarters. Now pass the Jalapeno Poppers already!